KUALA LUMPUR: IGB Corp Bhd (IGB), which will have RM800 million cash following the listing of IGB Real Estate Investment Trust (REIT), is looking at spinning off two more REITs in the next five years. Group managing director Robert Tan Chung Meng said that the group would ultimately like to have a hospitality and office REIT, but the exact timing for the product could not be determined now. "It could be anything between two and five years," Tan said. The timing, he said, now is suited for a retail REIT and hence it is establishing a IGB REIT, which will have two of Malaysia's most prized mall assets - The Mid Valley Megamall and The Gardens Mall. IGB's preference is also to have separate REITs for different business and not to place it all under the same REIT. IGB, a property developer, also operates hotels and manages office buildings to obtain recurring income. 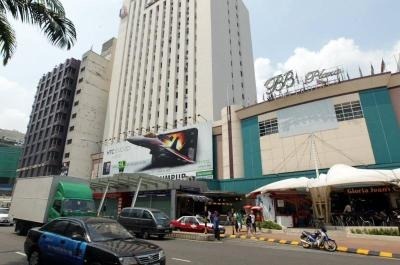 The listing of the IGB REIT is expected to be in September 2012. Some 3.4 billion units will be issued under the exercise for the two malls which have been a valued at RM4.6 billion. Currently, both assets come under KrisAssets Holdings Bhd, in which IGB has a 75 per cent stake. KrisAssets will sell the shopping complexes to the IGB REIT. IGB's stake in the soon-to-be-listed trust will be 51 per cent. The dilution of the stake would provide IGB with an estimated RM800 million in cash, following the listing exercise. 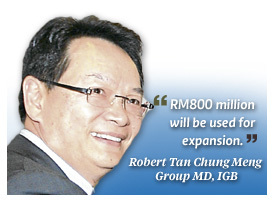 Tan, who was speaking to reporters following IGB and KrisAssets annual general meeting yesterday, said that RM800 million will be used for future expansion both locally and abroad. The board has no intention to maintain the listing of KrisAssets. Meanwhile, Tan said IGB continues to look for properties in the country and abroad for merger and acquisition purposes, and take advantage of the opportunity in the uncertain global economy which could offer assets at a bargain. PETALING JAYA: Glomac Bhd announced a 36.2% jump in its financial year 2012 (FY12) net profit from RM62.98mil to RM85.78mil, attributable to the commendable sales of its prime mixed developments. Its revenue for the 12-month period ended April 30 was 9.7% higher at RM655.61mil compared with RM597.48mil a year ago. In its filing with Bursa Malaysia, the group said the improvement was due to “on-going sales and progressive recognition of development projects in Glomac Damansara, Bandar Saujana Utama, Saujana Rawang and Glomac Cyberjaya”. In its press statement, Glomac elaborated that profits were anchored by Glomac Damansara, Glomac Cyberjaya and final billings from the completed Glomac Tower. “Our total sales of RM663mil achieved in FY12 were higher than our internal target of RM500mil, driven by our prime mixed developments,” group executive chairman Tan Sri FD Mansor said. He added that the launch of Glomac’s 39-storey Reflection Residences in March 2012 and the freehold serviced apartment project in Mutiara Damansara with a gross development value (GDV) of RM270mil received good response. The latter was 90% sold to date. Moving forward, the group’s earnings growth will come from its record unbilled sales of RM731mil, alongside its pipeline of development projects with a total available GDV of about RM7bil. Glomac has development landbanks of 200 acres in Sungai Buloh, adjacent to Bandar Saujana Utama and 192 acres in Dengkil for a new township project. These projects are estimated to generate a GDV of RM800mil each. Glomac is also proposing a final gross dividend of 2.75 sen per share less 25% tax for the financial year. The total dividend paid for FY12 is 5.5sen, 4.75 sen higher than the previous year. Meanwhile, Bernama reported that at an analyst briefing yesterday, group managing director and chief executive officer Datuk FD Iskandar Mansor said Glomac aimed to grow its market capitalisation to RM1bil from the current RM600mil in the next three years. He said the growth would be underpinned by both merger and acquisition (M&A) exercise as well as organic growth. “To grow the market cap from RM300mil to RM600mil took us about two to three years. So we expect a similar timeline for this objective. “However, the aim is still subject to the external economic factors and domestic demand,” he told reporters after the briefing.